Her dear old daddy needed. Said stamp, as well as tear it. She found she didn’t know him. He ne’er before had taught her. ¶ 5 Leave a comment on paragraph 5 0 One might expect to find this jokingly didactic poem about the need to teach children about philately in a philatelic paper, yet this appeared in the Washington Post in 1933. By the 1930s, literacy in stamp collecting grew far beyond groups of philatelists and individual collectors, as stamp collecting permeated public culture. From the 1880s to the 1930s, Americans slowly learned to see postage stamps as something other than purely a sticker that represented pre-payment for mailing a letter. In the poem above, Mary noticed the stamp on the “Rare Patriotic Cover,” because she had been trained to identify it as something special and worth saving. Like Mary, Americans of all ages knew that people collected stamps for a variety of reasons. Starting in the late nineteenth century, American newspapers, magazines, and eventually radio exposed their audiences to articles, columns, and programs about stamp collecting, and circulated the idea collecting was educational for its participants. Philatelists shaped those discussions by publishing primers on how to start collecting, giving lectures, volunteering with after school groups, and by holding public exhibitions of their collections. Collectors first read imagery on stamps and created a set of practices around collecting and interpreting those objects. ¶ 6 Leave a comment on paragraph 6 0 Those practices of reading that included learning convention of stamp designs and interpreting the imagery, were adopted and used by different groups. Stamps’ accessibility in price and in visual appeal made them attractive pedagogical tools for teaching geography and empire, for encouraging religious evangelization, for encouraging orderly and structured play, and for engaging with the marketplace. 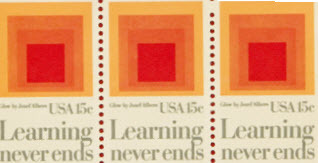 These efforts to educate students and adults overlapped over a period of fifty years, as different generations of Americans learned about the practice and about meanings embedded in stamps.